If the bird outside your window sounds like it's singing a familiar tune, it might not be your imagination. If the bird outside your window sounds like it's singing a familiar tune, it might not be your imagination. The songs of some birds really do contain musical notes and intervals similar to those found in human music, a new study has found. Canadian-American composer and music professor Emily Doolittle, working with Austrian and German biologists, discovered intriguing patterns in the song of a common North American songbird called a hermit thrush. 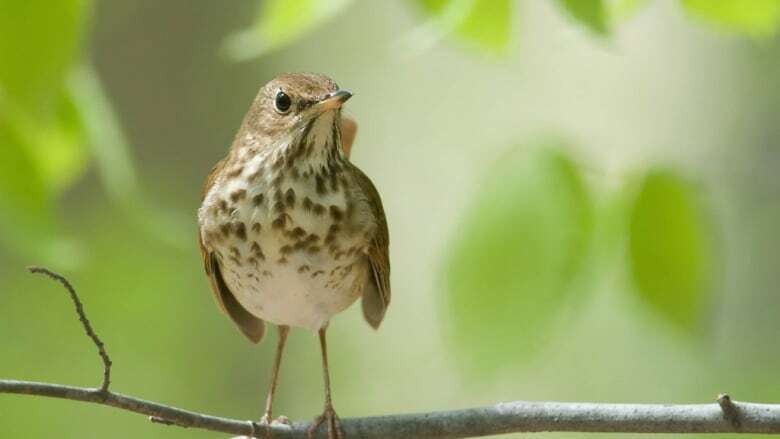 "The hermit thrush is clearly using some of the same ingredients to build its song… that humans use in creating their music," Doolittle told CBC's Quirks & Quarks in an interview that airs Saturday. Doolittle, who is originally from Nova Scotia, is now a professor of composition in the Department of Music at Cornish College of the Arts in Seattle, Wash.
She said she first became interested in birdsong while she was a visiting student in Amsterdam, and heard a European blackbird singing outside her window one night. "I was really fascinated by the way short bits of what it's saying sounded a lot like human music," she recalled. She thought she could hear scales and arpeggios. Like most songbirds, hermit thrushes sing to attract mates and proclaim and defend their territories, and it's mostly the males who sing. Doolittle said that in the late 19th and early 20th century, many naturalists described the bird as singing in major, minor or pentatonic scales, or changing keys as it sang. She was skeptical about that, as those kinds of scales are used only in certain human cultures. "And it really wouldn't make sense that another species would be following the music theory of one human musical culture," she said. She decided to examine the hermit thrush's song more closely. The bird's song is usually very high and fast, so she slowed it down and lowered the pitch a few octaves to something "more comfortable for human ears. "As soon as I did that, I started hearing that many of their songs actually followed the overtone series." The overtone series is used to build many human musical scales in different cultures, Doolittle says. It is a series of notes that can be thought of as the possible notes generated from a single string of a given length that is always anchored on both ends. Plucking the entire string generates the "fundamental" note. Anchoring the string in the middle and plucking just half generates a note one octave up – known as second overtone. Dividing the string in three and plucking a third, will produce the third overtone, a note a perfect fifth above the second overtone. Other overtones can be generated by simple division of the string (and multiplication of the original frequency) by a small, whole number. In the case of the hermit thrush, researchers did a statistical analysis of 114 song types produced by 14 male birds. It showed that about 70 per cent of their notes are the "overtones" of an "imaginary" fundamental note, Doolittle said. Doolittle said that although the bird isn't technically constructing scales, it makes sense that humans who heard the bird thought it was, since it was using musical intervals they recognized. In their paper, the researchers noted that there isn't any evidence yet that most birds sing in overtones this way. The researchers aren't sure why hermit thrushes do it, but one possibility is that humans and birds share a bias toward more easily remembering certain intervals between notes, they suggested. Doolittle said it might also be possible that hermit thrushes hear overtones in their environment, such as in wind whistling in the reeds. Previously, some biologists had theorized that humans prefer the overtone series because of our cultural exposure to human singing or the physical characteristics of the human vocal chords and our other vocal organs. "Our findings add to a small but growing body of research showing that a preference" for overtones is "not unique to humans," the researcher wrote. "These findings thus have important implications for current debates about the origins of human musical systems."